Shelley Robinson is a seasoned culinary veteran and one of Canada’s renowned female chefs. Educated at Dubrelle French Culinary Academy and Vancouver Community College, Shelley has co-authored four cookbooks and owned and operated two restaurants, a café and an artisanal grocery store. Her colleagues acclaim her advanced leadership style, working alongside sous chefs, sharing her culinary ingenuity, respect for local seasonal ingredients and absolute obsession with quality. Her empathetic yet fierce working style has enabled her to strike a balance, stay driven and defy the odds of women in the professional kitchen. Shelley’s cooking focuses on local, seasonal and sustainable foods. She has spent her entire career developing relationships with farmers, growers, and artisans. Chef Shelley has twice been nominated to represent Canada as a delegate for Slow Food in Turin, Italy. Her food has won the accolades of countless food critics and been featured in publications such as Avenue, Western living, Eat North, Where and Canadian living. A regular TV, radio and celebrity chef personality, Shelley was the 2014 winner of Food Network’s “Chopped Canada” and competed in the 2014 “Top Chef Canada.” An active member of Women Chefs and Restaurateurs, Chef Shelley was recently awarded the Julia Child “legacy scholarship” from Les dames d’Escoffier. 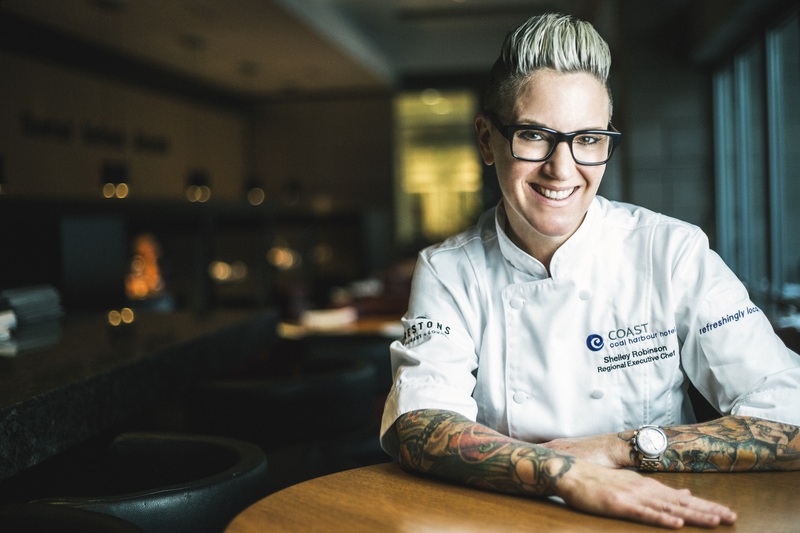 Shelley serves as a role model for aspiring female chefs in the industry and is a committed community member, using her culinary talents to create awareness and help for those in need. Shelley’s passion for the industry includes; consulting, catering, project management, training, financial leadership, special events, pop-ups and recipe development. Nothing gives her greater pleasure than sharing her craft and bringing people together to enjoy great food. No matter what or where she’s cooking from her large repertoire of culinary experience, this busy chef is committed to innovative, personalized cuisine delivered with her own brand of personality and flair. Subscribe to the Chef Shelley Robinson Newsletter to stay up to date with upcoming events. It’s no big deal. We only send out a few emails a year and you can unsubscribe anytime. For questions about private or corporate events or for questions about food consulting please contact Shelley directly at shelley@chefshelleyrobinson.com. You’re questions will be answered in 1-2 business days.